A resort town that’s alive night and day – Las Vegas serves up a vacation like no other! 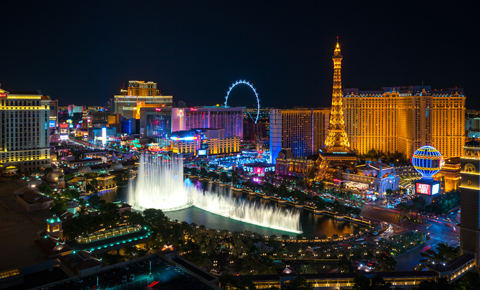 California Tours’ five Las Vegas Vacation Packages make it easy to love the neon city, and the breathtaking sights just beyond. Each package includes a trip to Grand Canyon National Park, so you’ll see both sides of the desert oasis, from the bright lights to the natural beauty and majestic canyons nearby. And, to expand your horizons even further, four packages add yet another region to the mix – such as Zion, Bryce Canyon and Death Valley National Parks; Los Angeles; or San Francisco. In only four to six days, your Las Vegas getaway hits numerous high points around the Western U.S. Arrive in Las Vegas and jump right in, with a brief tour of the famous Strip, the central thoroughfare where much of the action takes place. Your stay is filled with unique delights. Try your luck at the gaming tables and slot machines at famous casinos like the MGM Grand or the Wynn Resort. 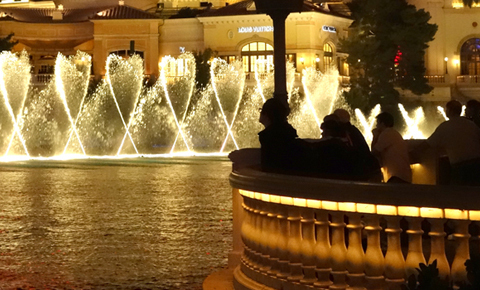 Shop at the Forum shops in Caesars Palace and see the famous fountain show at The Bellagio. Travel the world in just a few blocks from the Eiffel Tower of the Paris Hotel, to New York-New York and the Luxor’s ancient Egypt. Then, party ‘til the wee hours at one of the trendy clubs, or relax by the pool. Whether you want the full Vegas experience or just to see what all the fuss is about, every Las Vegas Vacation Package is flexible, with time to move at your own pace. And although Las Vegas is famous for its lights, parties and fast-paced atmosphere, the city also offers access to some of the most beautiful and majestic natural scenery in the U.S. Each Las Vegas vacation includes a visit to the breathtaking Grand Canyon National Park, starting with a guided tour by plane, and then by ground. If you want to keep going, California Tours will take you there! Additional possibilities for your Las Vegas adventure include the towering granite cliffs of Zion National Park, or the lowest spot in the United States — Death Valley National Park. 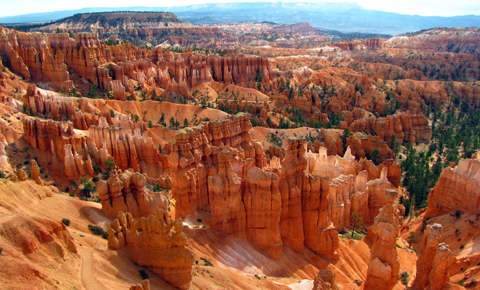 You may choose to see the rock spires of Bryce Canyon National Park and the rock monuments in Monument Valley. Las Vegas is near California, and so we also offer flights of fancy to Los Angeles and San Francisco. 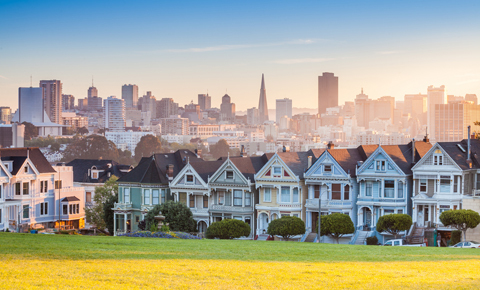 Each trip brings a world to life, with additional regional highlights available, including the Napa Valley wine region, the Pacific Coast, Disneyland or Universal Studios Tours, L.A.’s sparkling beach communities, and more. Our Las Vegas Vacation Packages start in Las Vegas and the Grand Canyon. 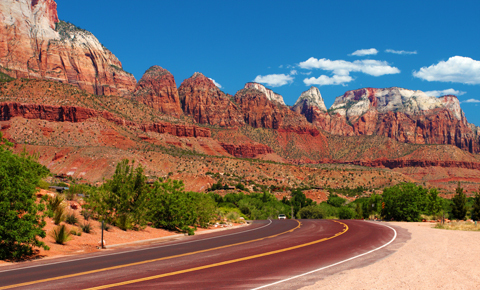 If you’d like to, you can move on to Zion and the Southwest National Parks, Los Angeles, or San Francisco. Our tours and sightseeing are designed for the independent traveler arriving in Las Vegas and wanting to tour the city and the surrounding area. The itineraries can be combined in any order and customized to any length, to suit your needs. For each vacation, you may choose from the Classic Package, offering a carefully-planned, comfortable and comprehensive experience, or a Deluxe Package, with additional options and upgrades.